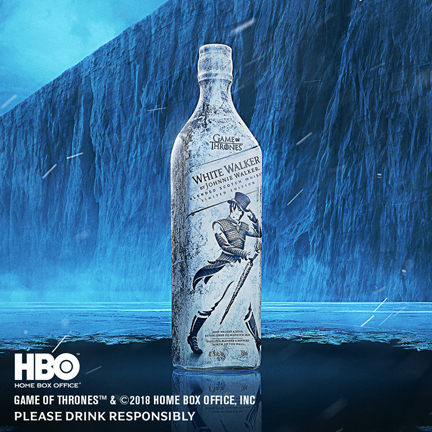 Send a raven, because winter has finally arrived in the Philippines with the release of the new limited edition White Walker by Johnnie Walker. It’s available starting today. The limited edition White Walker by Johnnie Walker is best served directly from the freezer. In collaboration with HBO and Game of Thrones, it is inspired by the most enigmatic characters of the hit show--the White Walkers--and is here for fans to enjoy as anticipation builds toward the final season premiering in April 2019. Created by whisky specialist George Harper alongside the small team of expert blenders at Johnnie Walker, this innovative whisky is best served directly from the freezer at 1.5 degrees. It develops layers of flavor as it warms to room temperature. It’s a great, easy-drinking whisky featuring notes of caramelized sugar and vanilla and fresh red berries with a touch of orchard fruit--creating a polished, sweet taste with a fruity twist. It features Single Malts from Cardhu and Clynelish, two of Scotland’s northernmost distilleries which have endured long, Scottish winters much like the long periods endured by those who have ventured north of the wall. White Walker by Johnnie Walker will be available until supplies last for P1,299 at www.spiritsbyjohnnie.com and all leading supermarkets nationwide. Winter is here, drink up!